Paper cups can’t be recycled because they’re not just made of paper; they’re usually also lined with plastic or wax to prevent the liquid from leaking through the cup. The sleeves are recyclable and should be disposed of with other cardboard products. Paper by itself is compostable, but if you compost used paper cups, they’ll likely leave behind microplastics in the soil, thereby contaminating the finished compost. Bring your own travel mug or tumbler to Starbucks, and you’ll get 10 cents off your cup of coffee. Why Don’t Most Starbucks Recycle Cups? 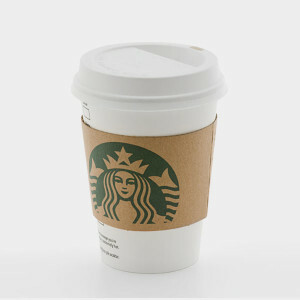 As of 2013, Starbucks offered recycling in 39% of its stores. You’d think it would be universal, but there’s no great recycling technology for coffee cups yet, so many commercial recyclers don’t accept them, leaving Starbucks with nowhere to send the cups. Read more about Starbucks’ efforts to recycle and reduce waste here. Could Paper Cups Be Transformed into Biofuels? University of Manitoba researchers have been studying whether cups could conceivably be made into biofuels. So far, the results are pretty promising.